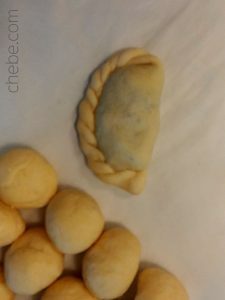 These empanadas are sooo tasty! 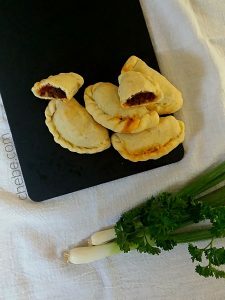 Filled with ground beef, potato, and beef chorizo that are perfectly seasoned with onions, garlic, paprika and more. And the chopped green olives give it an extra zing! ‘Empanar’… is Spanish for ‘to wrap in bread’. 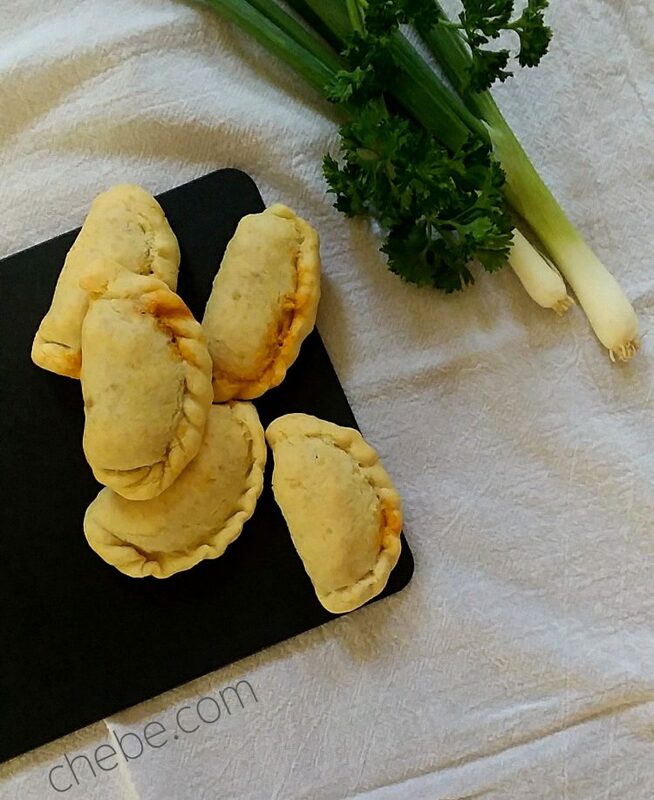 Empanadas originated in Spain and Portugal and are found in all of the countries colonized by them. They can be filled with meats, vegetables, and even fruits! 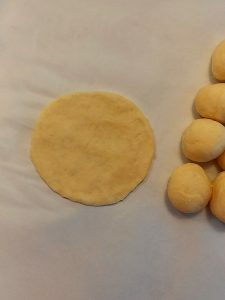 Chēbē dough has the perfect consistency for this Latin pastry as it can be rolled out and folded without breaking. 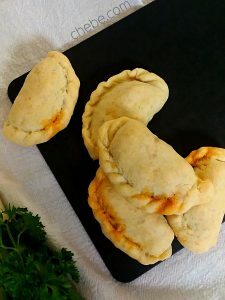 So, use your favorite empanada recipe, find some online that look appealing, or follow the awesome recipe below. 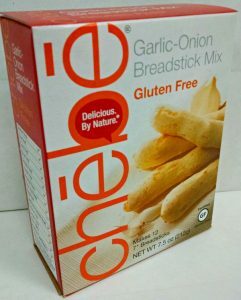 Gluten and grain free Chēbē will wrap any filling you fancy! 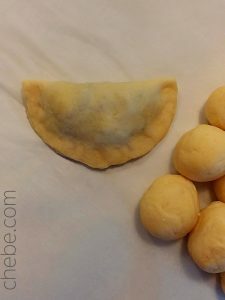 Here’s a good video that demonstrates how to fold an empanada. But be sure to wet the edges of the dough with water so that it has a good seal when crimping. Blend the ground beef and chorizo in a bowl. Season with salt and pepper. Fry in a skillet over medium heat for about 10 minutes or until browned. Add the onions, potatoes, garlic, thyme, oregano, paprika cumin cayenne, tomato and the broth. Stir and fry for another 10 minutes until the potatoes are tender. Taste for salt and pepper and add if necessary. Turn off the stove and stir in the scallions and parsley. Set aside and allow to cool slightly before filling the dough. 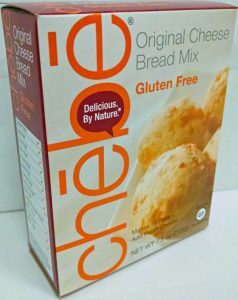 Place the Chebe mix in a bowl. With a fork, blend in the Parmesan, eggs, milk and oil. Mix for a couple of minutes with the fork, then use your hands and knead it until the dough is smooth and well blended. Divide into 16 equal pieces. (If you have a scale, each piece should be just under one ounce.) 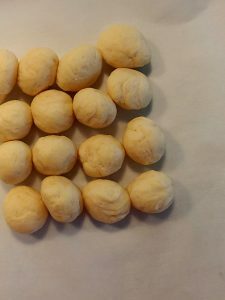 On a clean surface, use your fingers to press the dough ball into a circle about 4” in diameter. 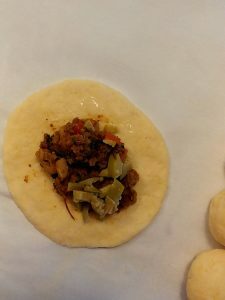 Place the dough circle in the palm of your hand and place 1 Tbsp of beef filling in the center. Add a small amount of the olives to this. Repeat this with the remaining dough balls and filling. 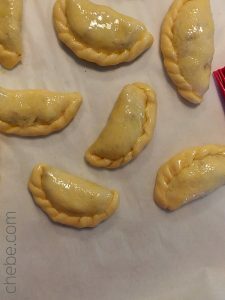 Place the empanadas on a baking tray. Parchment paper may be used but it is not required. Space the empanadas so they are not touching each other. 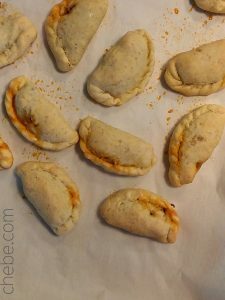 Brush the tops of the empanadas with olive oil or egg wash. Place in the oven and bake for 15 – 18 minutes. Remove, let cool for a few minutes, and enjoy! The filling can be made a day or two ahead of time if it is more convenient. You may freeze the empanadas and reheat them later.